The fourth monthly Greater Atlanta Coin Show of 2016 has come and gone. That means one third of the year is almost over. Though time passes more quickly as we age, we can certainly still enjoy what the days offer as many people did that visited the April coin show. Outside, the day offered early springtime enjoyment. Cloudy skies allowed some sunshine to peek through, and the morning temperatures began in the low 40s rising to low 60s by mid afternoon. Not quite shirt-sleeve weather, but the day still highlighted the blooms and spring green colors of the flowers, shrubs and trees. Both dealers and the visiting public enjoyed a busy bourse with the dealers' tables filled with a wide variety of numismatic and other collectibles while the aisles filled with people buying, selling and browsing the many treasures. As always, we certainly appreciated the many people who helped make the monthly coin show a success from the visitors to the dealers to the security to the hotel's staff. Thank you one and all. Based on the number of cars in the parking lot, the hotel hosted other busy events as well - not sure what they were other than a wedding related event adjacent to the show. This wasn't an actual wedding, though the hotel hosts those frequently as well. The bourse was so busy, we didn't have time to satisfy our curiosity about the wedding event's displays. As for coins, several people brought collections for verbal appraisals with several deciding to sell. Why would someone want to sell? Well, there are a variety of reasons. Sometimes, people inherit or are given numismatic collectibles but didn't catch the collecting fever to become a true numismatist. Instead, they prefer to sell the collection to support their interests be it a different hobby, a special purchase, a personal goal or maybe just to pay some bills. Then, there are the true numismatists that want to change their interests from one type of collectible to another or maybe to improve their collection from lower grade to higher grade coins. Of course, there could be many other contributing factors as well. 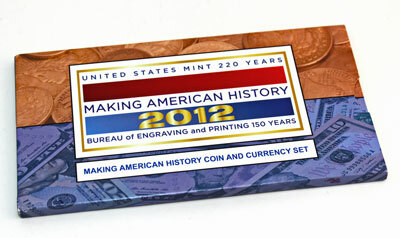 As for another collectible, let's take a look at the Making American History Coin and Currency Set from 2012. This set celebrated the United States Mint 220 Years and the Bureau of Engraving and Printing 150 Years. 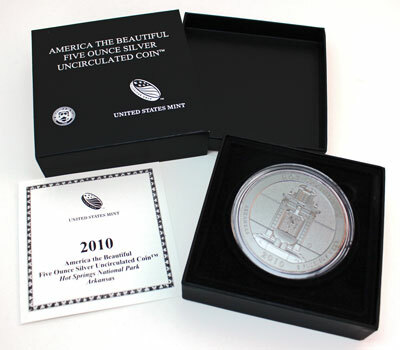 The set included an American Eagle Silver Proof Coin minted at San Francisco and a Series 2009 $5 Note from the Federal Reserve Bank of San Francisco. In addition, the $5 note commemorated the Bureau of Engraving and Printing's 150 years of service with a serial number beginning with "150." At the Sunday show, we saw people selling gold, silver, walking liberty coins, Indian head cents, mercury dimes to name just a few. And, speaking of Mercury dimes, did you know the US Mint will sell a Mercury Dime Centennial Coin this year? As usual, the coin show's bourse included a variety of items from ancient to colonial to modern day numismatics, from copper to silver to gold to platinum, from coins to currency to artistic stock certificates along with many other collectibles and supplies as well. Mark your calendar and visit the next Greater Atlanta Coin Show on Sunday, May 15, 2016 to see what new treasures the dealers have found to add to their displays. "The design of the dime, owing to the smallness of the coin, has been held quite simple. "The obverse shows a head of liberty with winged cap. The head is firm and simple in form, the profile forceful. "The reverse shows a design of the bundle of rods with battleaxe, known as "fasces" and symbolical of unity, wherein lies the nation's strength. Surrounding the fasces is a full foliaged branch of olive, symbol of peace." 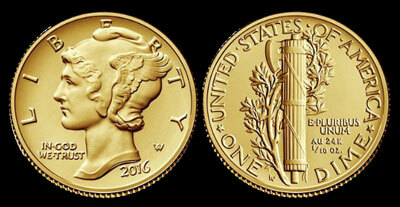 The US Mint's new gold coin, minted in West Point, keeps true to Mr. Weinman's design with the addition of "AU 24K 1/10 OZ." on the reverse. The US Mint released the new coin on 4/21/2016 with a maximum limit of 125,000.
Who knows, there just might be one, two or more on display at the next monthly coin show in May. 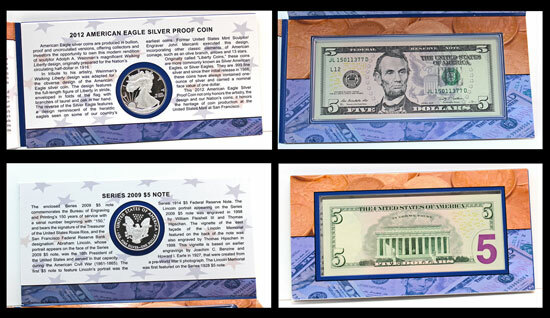 But, for the April bourse, let's highlight a couple of the US Mint's collectibles from recent years. First, let's take a look at two Five-Ounce America the Beautiful Bullion Coins, otherwise affectionately known as "hockey pucks." 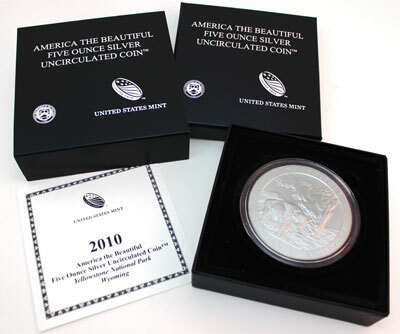 This version on the left includes the 2010 Hot Springs coin representing the Arkansas contribution for the America the Beautiful series. The right example shows the Yellowstone design, also from 2010, corresponding to Wyoming's America the Beautiful coin.